We partnered with American Legion Eden-Stanley Post 294 with sponsoring a Welcome Home Party for Vietnam Veterans. This event was free to all veterans who attended. The event served as the wellâ€“deserved welcome home for all Vietnam Veterans from the area. It was an honor to give Pine Beach Police Department Officer Okinsky this donation. Tragically, he lost his home and one of his dogs in a fire. Keto, Okinsky's K-9 dog, was trapped in the basement along with Officer Okinsky's other dog, Lola, but Lola died from her injuries. 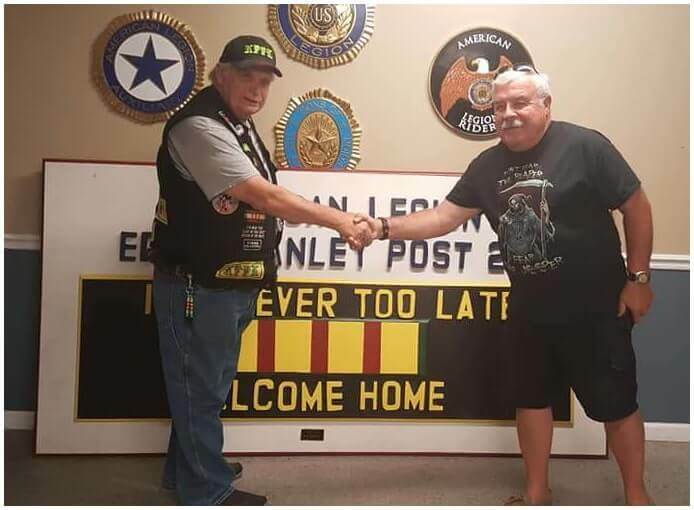 The Welcome Home sign was hand made and crafted by our own Oreo and donated to American Legion Eden-Stanley Post 294 for the event. Oreo also made the "In Honor of Those Who Gave All" and kneeling soilders cutouts. "I would just like to personally thank the tribase chapter once more for showing me and my two guys a great time last night, you all made us feel welcome and glad to be back in the states!!!!. We are all still pretty drunk at the airport, and one guy was still sleeping in his shower ( hrs total lol) but hell that just another story hahahahaha. 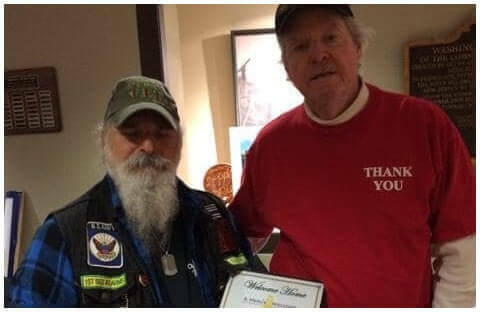 Truly an awesome time"
On April 19, 2018, our brother Suicide was honored and presented with a welcome certificate by the United States Vietnam Veterans Commerative Program. The Nam Knights of America Motorcycle Club, Tri-Base Chapter received a certficate of appreciation from American Legion Post 294 for our donation to their 2018 Boys State Program. They were able to send two local boys to Boys State because of our donation. We were presented with a flag that was flown in the face of the enemy at Bagram Airfield, Afghanistan by the 404th CA BN (A) by our Brother Flash. This flag and certificate will be proudly displayed at our home base American Legion Eden-Stanley Post 294. Each year we donate to the Lakehurst Police Department for their annual Toy Drive to assist them in their Holiday Toy Drive for local families in need. Pictured, above is Vice President, Hammer presenting a donation check to the Lakehurst Police Department. Each year we donate to the American Legion Post 294, Ladies Auxillary for their annual Golf Fundraiser. Pictured above is Chapter Founder and President, Pappy being presented with our ad from their fundraiser. During our first annual Open House and Fundraiser, the Chapter presented a check to the Veterans' United Military Memorial Museum. The museum has collections of memorabilia ranging from WWI through Vietnam. The display includes patches, uniforms, weapons, radios, medical gear and culturally related items. The owner travels to schools, picnics, etc. free of charge to display the collections of military memorabilia. On Memorial Day in 2017, we welcomed home Hammer's nepthew, Jason from his tour in Iraq. Each year in Washington DC, the Nam Knights of America Motorcycle Club takes time to honor our Vietnam Veterans and fallen Police Officers. In 2017, Chapter Founder and President, Pappy represented the Chapter by laying a wreath with the Metrolina and West Virginia Chapters. "Learn how the Nam Knights MC is helping veterans and police officers while honoring those who have lost their lives." "Escape the wind and stop by the Heritage Hangar in 2201 here at the #PowerinthePines #OHAS! ! 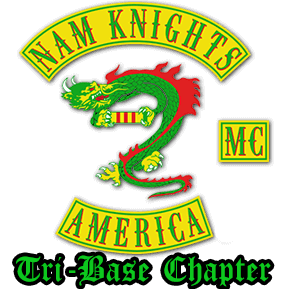 Make sure to check out the #NamKnights America #MotorcycleClub (Tri-Base Chapter) tent! 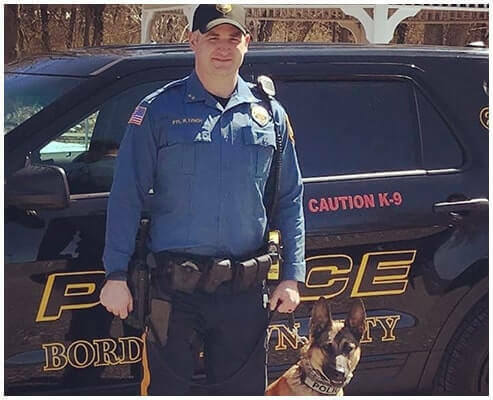 Their mission is to honor the memory of the #American #Veterans and Police Officers who have lost their lives in the line of duty and to assist them in their time of need. ALL proceeds benefit local #heroes! (They have cheap water too!)"